You Could Lose Your Job…Permanently. Everyday, millions of people use social media as a means of communication. If you have been reading my blogs thus far, you know the deal about online permanence: social media sites make it easy for people to say or show things to the rest of the world, and, with that said, the Internet then becomes sort of a digital permanent record. Everything an online user is responsible for publishing stays in cyberspace and will be there until tomorrow, six months from now, and for many years to come. When we think about permanence, of course the top factors that will pop into our heads are Facebook posts, Tweets, YouTube videos, etc. We may even think of blog posts, like this one, that allow people online to share their interests and thoughts on different topics. However, do we ever really acknowledge the comments that people leave on other people’s works? There have been news reports and articles that speak of people—famous and not—who have done things online that have cost them their jobs. Tweets and pictures posted on Facebook are the most common evidence of people’s mistakes online. However, when it comes to posting comments on blogs and other articles, who would think that one’s chances of getting caught in that environment could be that great? Kotaku is a site dedicated to video games. It is a hub for blogging, cheats, news, and reviews. Earlier this year, blogger for Kotaku, Jason Schreier posted about two employees from Alpine Access, Xbox’s tech support system services. Both employees had very similar situations occur on Kotaku where they left comments that mentioned their company. The first former support agent for Xbox ‘s comment was seen by a higher member of Microsoft who then brought it up to the manager. The man Schreier refers to as “Bob” said, “I was then reminded that we weren’t allowed to speak about the company, or anything related to it on social media sites or any related sorts.” After being asked by his manager if he had mentioned the company on Kotaku, Bob responded that he had, and was given a three-day suspension from work. On the third day of his suspension, Bob got a call from his manager…he was fired. In an email, Bob had said, “I believe this entire thing was taken a little too far. I understand that it can make Microsoft look bad with an employee talking bad about their customer. But what I was saying wasn’t as bad as they are making it seem.” Below is Bobs comment on Kotaku. The second man from Alpine Access was also fired from his job after commenting on Kotaku, his scenario being a little different from Bob’s. “A couple of months ago, [“we’ll call him ‘Frank’”] was asked to get on a conference call with three Alpine executives who accused him of stealing from Microsoft by generating codes that give out free time on Xbox Live’s premium Gold Membership” (Schreier). Frank said, “They claimed the reason they’re firing me is because I broke the non-disclosure agreement I signed when they hired me. This agreement stated that I’m not allowed to tell anyone I work for Microsoft or Xbox.” Below is Frank’s comment on Kotaku. Surprisingly, Frank was a good sport when responding to being fired for his comment, “In all honesty, if I was an employer and my employee wrote something like that about a product I was trying to sell, I could see myself firing them too…I’m upset about losing my job, but I understand where they’re coming from.” As unfortunate as this story is, these two men learned their lesson on what not to say online that could cause trouble. One could only hope that others learn from these stories and be careful about what they say/do on the Internet. What does a song sung by the Muppets have to do with writing and technologies? I’m not talking about Pokemon, and although that tune is just so catchy, a Pecha Kucha is neither of those things. Devised in Tokyo, a Pecha Kucha is a presentation in which the presenter(s) is limited to a small number of seconds to speak per slide and elaborate on different topics that relate to the display of pictures, alone. The format of a Pecha Kucha is concise and fast-paced, which made classmates pretty nervous. Practicing our lines over and over again to get the words to perfectly correspond to the picture on each slide was a pain, and personally stressed me out. However, in the end, every group’s presentation went really well; despite all of the aggravation, the Pecha Kuchas turned out to be successful and overall, a new and interesting experience. The topics covered by these presentations included: Saftey, Freedom, Etiquette, Anonymity, and Permanence with regard to writing in online spaces. 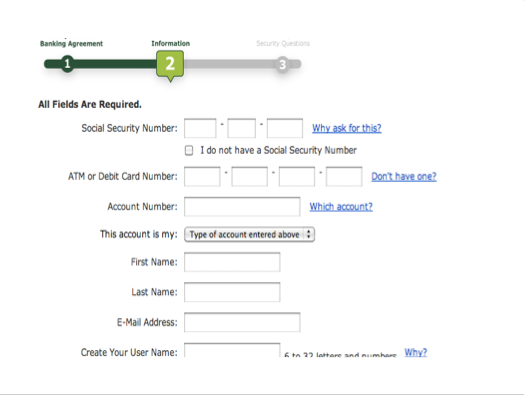 For my third slide in my group’s Pecha Kucha on Permanence, I chose to include a screen shot image of a sign up page for online banking with TD Bank. Although there were plenty of options for taking screen shots of different webpages with fields waiting to be filled with one’s personal information, I believe my picture got the point across. Besides cybershopping, online banking has become a new craze, and one that can be overestimated when it comes to the privacy of one’s identity. People don’t often realize that once their information is in the system and “locked up” in cyberspace, it is permanent; there are unforeseeable possibilities of one’s person information being found, stolen, shared, and even used. Take online banking for example; in order to sign up for an account available via the Internet, one must enter their information that should not be known to anyone else but that person. It seems quite mind boggling that there are online users (or hackers) that know secrets of breaking into cybervaults and accessing the information of others, almost like it is a practice. The problem is, there are only so many ways that a person can protect their information once it appears on the computer screen. I had blogged about an article on a website that leaked sensitive information of many celebrities. The website showed addresses, social security numbers, credit scores, and other records of stars such as Jay-Z and Britney Spears. I chose to include the cited text that I did in this slide, because I wanted to emphasize the risk of submitting personal information online. The quotation from USA Today said, “The site did not state how the information was obtained or why the people targeted on the site were selected.” This scenario could honestly happen to anyone; I feel that once word gets out that the rich and famous can even be robbed of their private identities, then that is when other online users come to the realization that, “Wow…that can happen to me too.” As a part of my whole 5-slide section of the Pecha Kucha, I saw this slide as presenting a fact followed by a warning. The slide focused on the idea that there are so many ways in which we fill out information online; surveys, membership accounts, and online shopping are just a few examples. Of course there’s no way of knowing what can or will happen to our information once it’s in cyberspace; it’s just a risk that we are all apparently willing to take. I felt that this slide was arranged nicely, for the following slide touched on the fact that websites are personalizing what we search for using signals that track all of our actions online. With this order, the audience sees a small factor of permanence and then goes into the bigger picture—pretty much everything is permanent, and with much more scrutiny online today, users need to be cautious of what information they publish and where they put it. If I could have done anything differently with this slide, I think I would have used a different quote from the article I got it from. My narrative for this slide was a bit difficult to recite, and I got a little tongue-tied. Then again, twenty seconds was a short amount of time to fit a lot of words in, to begin with! With the topic of Permanence, my group created a blog on WordPress.com named, “Always There, Never Gone”. Group members had to blog up to two times a week for four weeks, posting about readings on Web 2.0 and how they related to permanence, and also about an article of our choice relating to our topic. After four weeks of relating class readings and discussions to the theme of permanence, I have learned greatly about the many ways in which technology is almost like a trap—whatever happens online stays online. From tweets, to Instagram posts, statuses on Facebook, online memberships, and even text messages, there are plenty of opportunities for people’s actions to become permanent, beyond their control. There are other technologies that keep track of users’ actions online. In this way, businesses are able to satisfy the needs of consumers more effectively, and websites can layout guides and suggestions to make online searching simpler for users. In Duhigg’s article, he writes about Target’s assigned Guest ID numbers for its customers through the experiences and findings of Statistician, Andrew Pole, who says, “We want to know everything we can.” Is finding information about others that goes far beyond what their names are or their IQs helpful for companies in advertising their products—absolutely! However, the idea that everything online users say or do is—in a way—monitored, is something that we should always keep in mind. I have learned through this class that the world of technology is rapidly changing, and that goes for those who use technology as well. However, whatever people are responsible for online, and even through phone technologies, always remain. My group’s topic was “permanence” which references our blog name “Always There, Never Gone”, and we had to research and find information about this word. We had to make a presentation called a “Pecha Kucha” on our theme and show how a lot of things are permanent whether we like it or not. For one of my slides, I chose to talk about the permanency of the application Instagram we have on our phones. To accompany my narrative, I chose a picture of some random person’s Instagram on my phone and “screen-shotted” the picture. This picture shows a person pointing to some guy’s back that was written all over in permanent marker while he was drunk. 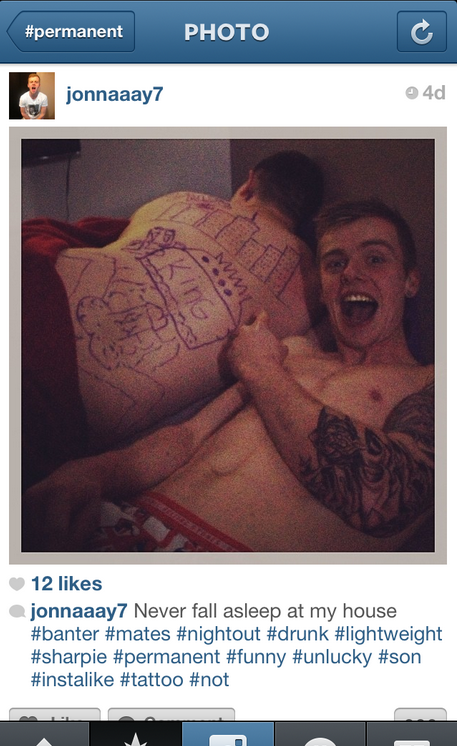 He tags a bunch of words such as “nightout, drunk, sharpie, permanent, funny, unlucky…” The only thing he does not tag is his friend so now his friend that was drawn all over his back does not know he is in a picture on Instagram. This picture is perfect to show how posting pictures on Instagram is permanent because once it is on there, it will always be there especially if you do not even know that you are on it. This poor boy got written all over his back when he was drunk and someone took a picture of it to show the world. The friend that is pointing to his back, not only is posting the picture, but his Instagram is not even on private. By having his Instagram not on private, anyone from anywhere in the world can see it and that is exactly how I saw this picture. I simply typed in “#permanent” and this is what came up. I now have a picture of this picture even if this man in it does not want everyone to see that he was stupidly drunk one night. Who knows, he may not even know this picture is online. The quote that I incorporated into my narrative is from Rebecca Rosen saying “You don’t even need to reproduce anything anymore, you merely share with a click.” This quote shows that someone can do anything with any pictures by just pressing a button and then it is there forever. You cannot take back something you put on the web after you “share with a click.” This picture adds to my other slides to show how permanency through the web is real. Permanency is a scary word when thinking about social media. Adding this picture for my slides, really brought it all together because it is a real life picture that I showed to all of my classmates and these boys do not even know it. I really do not think I would revise this slide because it truly shows the meaning of permanence. When first getting this topic, I thought it was going to be difficult and in the beginning I wanted a new topic to research because I thought I would not find much on it. However, after reading my group members blog posts and researching for articles about this theme, I found out a lot more than I thought of. After reading in depth about this topic, I opened my eyes to new ideas of things being permanent. For example the reading “How Companies Learn Your Secrets” written by Charles Duhigg, he explains how stores recognize you under a certain “Guest ID” number and that is permanent. Once you walk in a store, your guest ID number is permanent; they always will have your information. I never thought of this before and this opened my eyes. I did a lot of research on social media for this topic because everything we put on the internet is going to be there forever. It has entered the world of cyberspace once we click a button to submit. I never heard of the website “We Feel Fine” before and going on this, really enlightens me because I think to myself, why does someone want to post on this site for people to see how you are feeling? What is the point of that? Once you do it, everyone is going to know that someone out there is feeling a certain way, but who cares? All of these sites including Facebook, Twitter, Instagram, Snap Chat, and YouTube are all ways to tell the world something you cannot in person. Even when it comes to blogging, you are letting everyone read your information you write and you cannot take that back. I have never blogged before this class, but I know that everyone can see what I am writing about. When I read Hope’s blog about a couple who was obsessed with raising a virtual child on an online game, I was astonished. This is another way of using the word permanent because they let the baby died because they left her unattended while playing this game. This death is permanent and they cannot get her back. Overall, I am glad that I had done research on this topic because I have a new view on permanence and that is to ALWAYS be careful with what you do because somehow in some way, it will always be permanent. Intro: The first part of my reflection is written about the second slide of my portion of the Pecha Kucha, which discusses virtual gaming and how it’s becoming more like real life (isn’t that ridiculous?). For my second slide, I chose a screenshot of a Sims game, which is a virtual world on your computer that you run completely. I had began discussing the permanent affects of becoming virtual gaming on the previous slide, and I wanted to continue discussing that in further detail. I chose this screenshot in particular because this game really highlights how the world of virtual gaming is becoming more in touch with the real world, outside of the computer. This picture compliments the narrative for this slide by showing how virtual games mimic real life, and depict it in their own digital way. 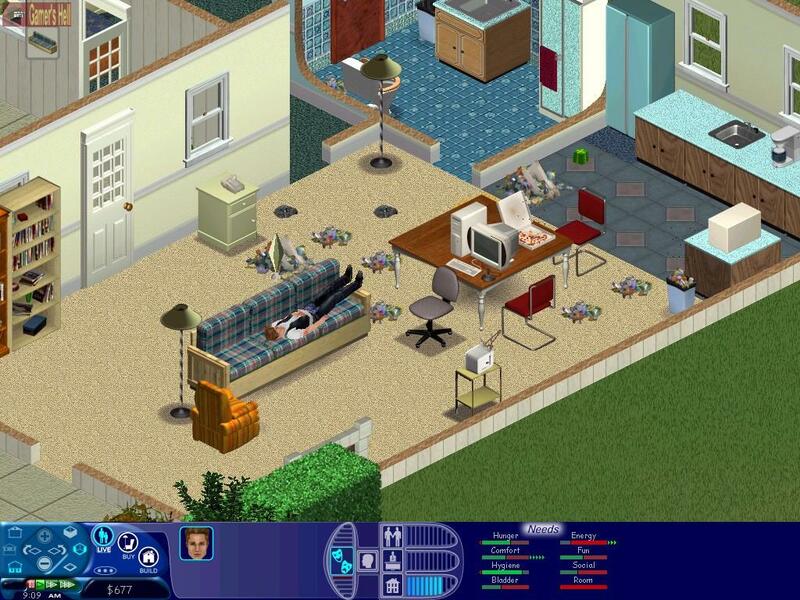 The screenshot of the Sims game shows the interior of a house, complete with furniture, a variety of rooms, and even a character. It’s clear that companies are trying their best to make people feel as if they are in the real world when they play these kinds of games. David Perry’s video, “Are Games Better Than Real Life?” perfectly describes the point I was trying to reach on this slide, which is why I decided to site him. One of the statements made by Perry is that video games will “be more lush, complex, emotional experiences- more involving and meaningful to some than real life,” (Perry). I picked the word ‘lush’ out from this statement to put in my narrative, because I feel like that word describes the caliber of what level of reality companies are trying to reach in their games. This slide represents one of two main sections in my narrative- virtual gaming and Twitter. Throughout my 5-slide presentation, I tried to explain how the use of these two things have permanent outcomes. Slide 2 fits in because it gives a good visual as to how serious virtual gaming is becoming as time goes by. The picture I chose and the narrative correlate, giving a brief description on how virtual games might eventually feel more real than anything offline. It continues to build on the first slide, where I stated how virtual gaming can turn into an addiction. The more ‘lush’ games become, the more they will intrigue people and capture their attention. The ideas in this slide were added on to the first slide to reiterate how virtual gaming can pull people away form the real world. Overall, I don’t think I would’ve done anything different on this slide, but if I had the chance to revise it, I would further search for a screenshot of a ‘virtual child,’ to really get the point across that people take this world of gaming seriously. Intro: The second part of my reflection talks about what I learned about my blog topic, which is permanency. It discusses how my perspective on the Web 2.0 has changed through the research and readings done in and out of class. When my group picked ‘permanence’ for our blog topic, I honestly didn’t know how much there would be to say about that. It was a topic that I had never studied, and I was pleasantly surprised when I found that I was able to relate different articles from class and other articles I found on my own to that topic. It seemed as if it was too narrow, but overall, I learned a lot of different ways that going online can cause permanency problems. I gained a new perspective on the topic, realizing that everything we post will always be stuck in cyberspace, and read what some of the possible consequences are and how permanency online has affected others. I am an avid Twitter user, and have been since my sophomore year of high school, which was 4 years ago. In my time on the site, I have seen a lot of horrible things posted, such as negative comments towards other people and very personal, disturbing thoughts. A lot of people don’t have a filter, whether they’re online or offline, and say whatever they feel, despite the possible consequences. Through my research, the readings in class, and separate articles that I found, I realized that everything will say will always be stuck in cyberspace. Even if you delete a tweet, anyone could have read it, saved it, or taken a picture of it. Steven Johnson’s article, “How Twitter Will Change The Way We Live,” was one that I used for my Pecha Kucha, and it really broadened my ideas on permanence. He stated that Twitter “added a second layer of discussion and brought a wider audience into what would have been a private exchange,” (Johnson). I cited this in my narrative because it gave me a new perspective to permanency on the web. This statement taught me that nothing is private in cyberspace, and every single thing you say, even if it’s directed towards a specific person, will make it’s way around to other people. Throughout most of the articles we had to read, including the article about filter bubbles and Margaret Atwood’s piece, I found a common theme that shows the correlation between permanency and Web 2.0. The theme is that every portion of the Web will always be stuck there, so it’s important to have a filter online and think before you type. After doing so much work on this topic, my perspective on the Internet truly has changed. I am definitely going to think twice before I post a Facebook status or a tweet, because I don’t want anything to come back to haunt me years down the road. Doing this research has given me a much better outlook on how to be careful, or I might regret posting something small one day.